An extended early nineteenth century piece, fine and exuberant, for flute and guitar. Historically extremely interesting, incorporating as it does in a remarkable way elements of Greek popular music of the time. New re-engraved edition (not facsimile), with an extensive preface. 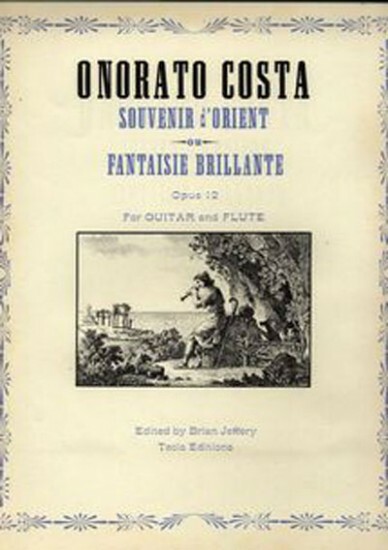 Score with separate flute part, 20 + 8 pages. First published by Tecla in 1983. This is a remarkable and attractive work, challenging from the technical point of view. Anyone seeking new repertory for this combination of instruments is recommended to try this. It incorporates elements of Greek popular music of the time. One section is "Romance grecque. Ilios Lambros, Soleil Lumineux", and another is "Sirtos, Danse grecque nationale". An interesting example of the enthusiasm for Greece at this period of the struggle for Greek independence.